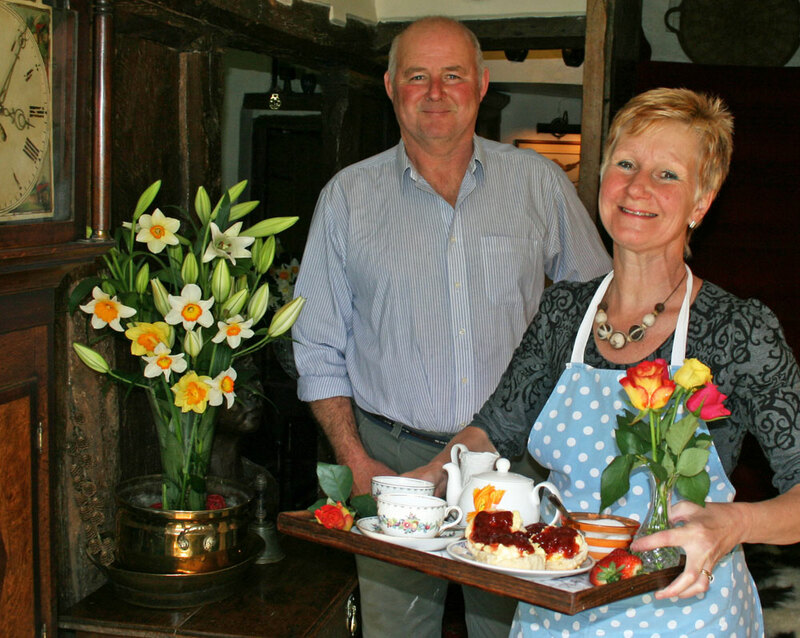 LOCATION; Situated close to Exmoor National Park, in picturesque North Devon countryside between the villages of West Buckland and East Buckland, just 2 miles north off the A361, Atlanic Highway. 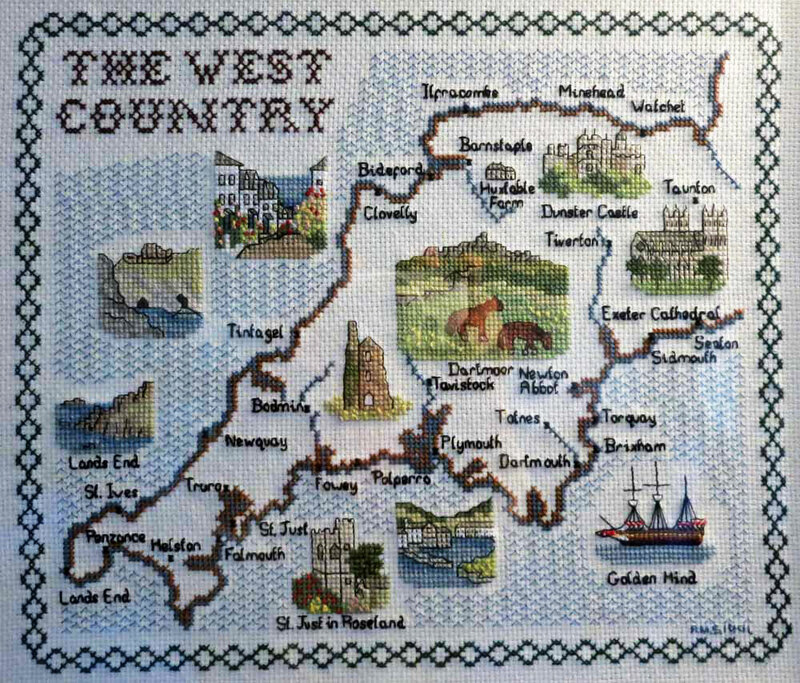 On the Tarka Trail and Macmillan Way about 7 miles east and 5 miles west of the historic market towns Barnstaple and South Molton. This is an ideal hideaway for exploring Exmoor National Park, North Devons coast with it’s historic harbours Clovelly, Lynton & Lynmouth and sandy beaches; Woolacombe, Saunton Sands and Westward Ho! Travelling via M5, come off at Junction 27 (approximately 32miles from Huxtable Farm) and follow A361 west. Take right turn signposted West Buckland & East Buckland and ‘West Buckland School’ (approximately 30 miles from M5 and 2 miles AFTER North Aller roundabout with the ‘North Gate Inn’ – DO NOT turn off A361 at the roundabout like some SAT NAV’s tell you to). Drive through West Buckland village in the direction of East Buckland. 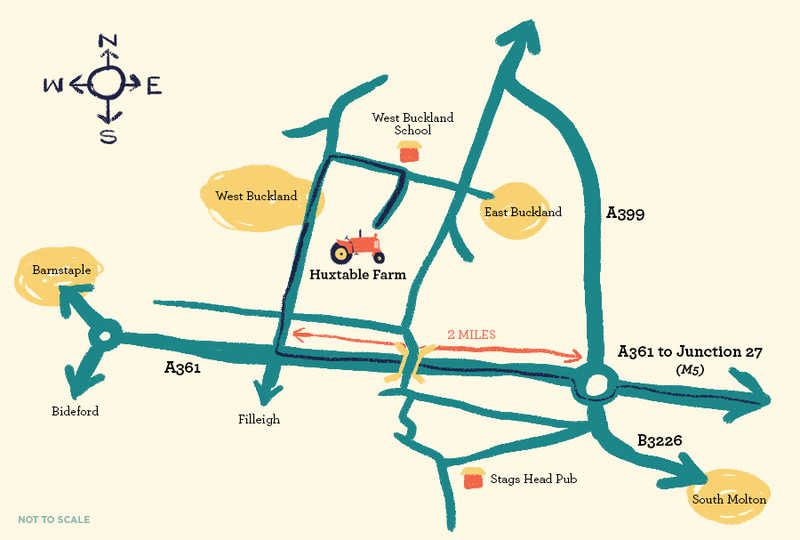 The entrance to Huxtable Farm will be seen on the right opposite West Buckland School, halfway between West & East Buckland villages. Have a safe journey and we look forward to welcoming you. 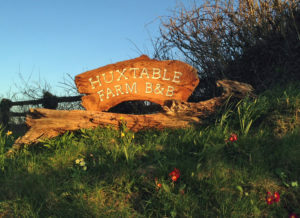 Look out for ‘Huxtable Farm B&B’ wooden sign at the entrance to Huxtable lane, a half mile private lane leading to Huxtable Farm Bed and Breakfast. SAT NAVIGATION: – Please note that some Sat Nav’s, if travelling from the east, take you up some very steep, narrow, bendy lanes, so please read our directions above or programme your navigation system to go to West Buckland Village (Devon NOT Somerset) first (EX32 0SQ) and upon reaching the village enter Huxtable Farm’s postcode EX32 0SR. journey. TRAVELLING BY COACH: – National Express Coaches stop at South Molton (5 miles)and Barnstaple (7 miles) TAXIS; – Dave’s Taxi 07733 447978, Legend Taxis 07503170146, Mumm’s Taxis 07773344777, A1 Taxi Service Boutport St, Barnstaple Tel; 01271 322922. Barnstaple Castle Cabs Tel; 01271 377771. South Molton Taxi Service Tel; 01769 573636. Number6 Taxi’s Bideford Tel; 01237 666666. CAR HIRE; – Enterprise Rent-A-Car, unit 4G/Old Station Rd, Whiddon Valley Industrial Estate,Barnstaple, EX32 8PB, Telephone: 01271 852900. The Metro Centre, 1 Mill Rd, Barnstaple, EX31 1JQ, Telephone: 01271 323268. Scot Hire, Riverside Rd, Pottington Business Park, Barnstaple, EX31 1TE, Telephone: 01271 314555. TRAVELLING BY FERRY: – Plymouth Brittany Ferries is the nearest Ferry Port 70 miles away via Dartmoor or 90 miles away via M5 and A361. Good evening., I am interested in purchasing one of your Jacob’s fleeces for spinning and was wondering if you have a list I could be put on for when the fleeces become available in 2019 following shearing. Please feel free to contact me again in June to remind me though.